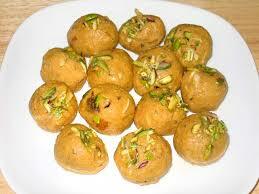 Besan ladoos are rich, sweet dessert-snack made from gently roasted besan. 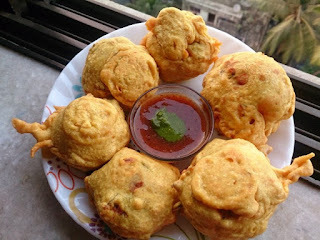 Besan Ladoos can be served any time of the day. Serve- 14-16 ladoos Cooking Time- 30-40 min. Put the besan (gram flour), sooji, and melted butter in a large frying pan and mix. Turn the stove on to medium heat and begin to roast the basen mixture until besan becomes light golden brown in color. Stir the mixture continuously with a spatula to prevent burning. When the color has changed you will also start to smell the sweetness of roasted besan. This should take about 7 - 10 minutes. 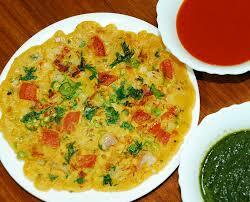 Remove the pan from the heat and let the besan cool to a warm temperature. don’t let it become to room temperature. While the mixture is warm add and mix cardamom seeds, almonds, and sugar. 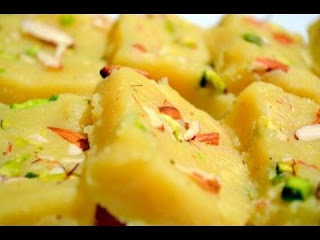 Besan ki barfi..........Make this favorite sweet at home with very simple ingredient, besan, ghee and sugar . Place a non-stick frying pan on stove and let it heat on low flame. Add ghee and let it melt, Add besan and stir fry until it gives out aroma. Ensure that it does not change its color. Blend well to mixture in pan and make sure that the mix does not form lumps. Add sugar and water and mix well. Remove from heat and stir in cardamom powder. Grease some oil on the bottom and sides of a large tray or thali. Pour the mixture and spread out to measure one inch thick. Cut into small squares or diamonds and serve. You can store these besan barfi to 8-10 days. It is a quick and easy to make for breakfast. This is also great evening snack with a cup of tea. The cheela comes out best when generously roasted with oil. You can add fresh grated more veggies like beans, cauliflower, corn and cheese for new Innovation. green chillies-finely chopped- According to taste. Mix the basen and all chopped veggies in a bowl. Add saltm coriander leaves and green chilli. Add enough water to make a dosa-consistency paste. Pour some Oil the heat tawa. Pour one big ladle of the batter for chilla. Add oil as per taste.